1 There are many things around the house that are dangerous for pets. It is important that these things be kept away from your pets all the time. 2 Antifreeze smells and tastes very sweet to a dog. Dogs will drink it from puddles that they find in the garage or outside in the driveway. Antifreeze kills many dogs every year. This happens a lot in the winter. If you think your dog has drunk antifreeze, call your vet right away. 3 Chocolate has an ingredient in it that can be very dangerous for dogs. There is more of this ingredient in dark chocolate. It usually takes a lot of chocolate to kill a dog, but a smaller dog wouldn't need to eat as much. The chocolate can cause seizures, which can be serious for a dog. 4 Bleach is dangerous for people. It is also dangerous for dogs. 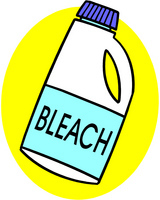 Most people keep bleach in a place that is out of reach of children. Follow the same steps to keep your dog safe from this product. 5 Giving a dog as few as two Tylenol can kill it. A dog's liver does not have what is needed to break down this medicine. This can cause drooling and stomach pain. Call your vet if you think your dog has ingested this.